Remember when blogging was exclusively used for niche groups or websites like Xanga or LiveJournal? Well, those days are long gone, and blogging has become a staple in almost every marketing strategy. It's a way to connect with prospective clients, become a thought leader in your industry, and share your company’s unique voice with the digital world. Did you know that businesses using blogs as part of their content marketing mix get 67% more leads than those who don’t (Hubspot)? Despite all the great benefits of blogging, it is often overlooked and underused. Let’s dive into four key benefits of blogging and why it’s so important for B2B. One of the most significant benefits of blogging for B2Bs is that it puts your website, the online face of your business, on display for search engines to crawl. Blogs can attract more qualified website traffic, and this can lead to an increase in new clients. According to HubSpot’s research, 42% of companies have acquired a customer through their blog. Each blog post is a chance to focus your efforts on topics that truly align with your business. Blogging creates an opportunity to use long-tailed keywords that can bring targeted traffic to your website in more ways than just a visit to your homepage. For example, by creating content that answers a question, often in the form of a longer tail keyword, you have the opportunity to target these questions users are looking for answers to and drive people directly to deeper resource pages on your site. With many ways to share content online, your blog can get optimal online exposure, putting you in front of prospective clients that may have never come across your business had you not utilized blogging as a marketing tool. 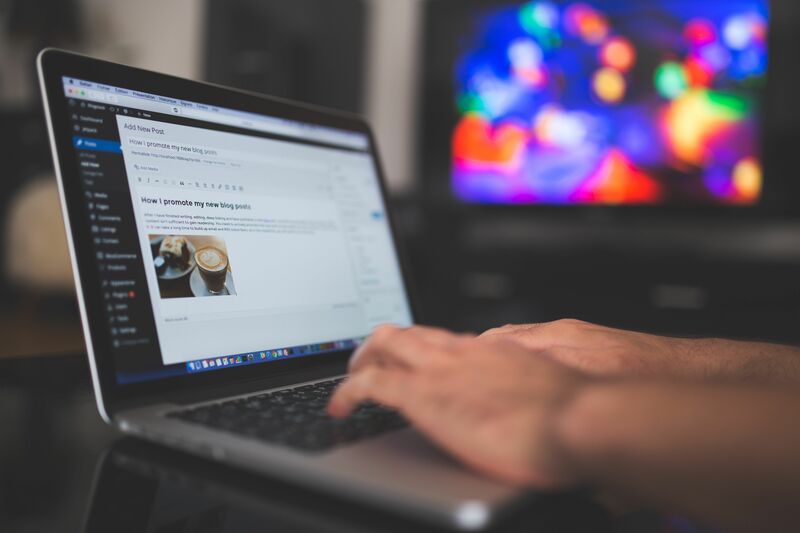 Every time you publish a piece of blog content to your website, it's an opportunity to enrich the mind of your website visitors and engage potential customers. Through blogging, you can educate clients in a way that reinforces what your business sells. Blogging also helps your business gain insight into what clients are looking for. By merely allowing comments or feedback and engaging with readers, you can learn where clients lack in education and what problems they are facing that your business may help solve. For this reason, a blog strategy for B2B often becomes about providing educational resource content that solves a need or answers a question, perhaps even before a potential customer understands that they have that need. The primary way prospective clients find content is through search engines like Google or Yahoo and now, with 40% of adults using voice search, it’s more important than ever to give your business multiple opportunities to gain web exposure. With blogging, you can tap into prospective client buyer personas. A buyer persona is an example of your ideal customer based on data and research. Through blog analytics, you can see what type of content prospective clients are engaging with, and their engagement helps to identify their buyer persona. This allows us as marketers to strategically craft our message to promote our services to the people who need them. Understanding buyer personas can also help you produce quality content that is actually relevant and helpful to customers. Through blogging, you will have the ability to position yourself as a reliable source, and with that, your relationship with clients has the potential to grow tremendously. With blogs, you can establish brand credibility and provide consumers with the confidence that you are an expert in the industry. I know what you're thinking: "How is my B2B blog going to shine through in a world that's overrun with content?" You're right to feel like establishing this kind of credibility seems impossible in today's digital world, but consistency is key here. Staying true to what you know and producing consistent content can build a reliable reputation online, making your company the go-to source for certain industry information. Your B2B prospects are online searching for help, guidance, statistics, and answers to so much more. With consistent blogging, those prospects will find your blog when they hit "search," and if the information is honest and educational, it will nurture those prospects into returning visitors. As a business, your actions speak loud, and with blogging, you are showcasing your expertise and knowledge rather than telling. Blogging provides an opportunity to repurpose content. Starting a blog for your B2B can create content that lives beyond one single website post. For each blog post, you can add a few touches to tailor the content for other platforms. By catching the attention of potential clients with repurposed blog posts on other sites, you can boost your marketing strategy. A few examples are turning blogs into videos or infographics, highlighting and expanding on blog post feedback or questions from readers in the form of a newsletter or e-blast, turning blog posts into content for a business podcast or structuring a free course around a blog post. The repurposing possibilities are endless. Blogging is not only a great addition to your marketing plan, but your posts can be the driving force in engaging content on other platforms. Regardless of the size of your B2B, blogging is an essential addition to the success of your business. It's an opportunity to connect with and understand consumers; generate content that can put a voice behind your business, and it can position you as an expert in the industry. Blogging is a tremendous opportunity to create content that will provide long-term digital results. Get in touch with the Digital Services Team at Mole Street today to discuss blogging and more strategies to elevate your online brand!